Anyway, both were this afternoon... first was for a sheriff deputy to go to an address in MonroeTown or Raisinville or even LaSalle township (I didn't look it up to see which)... check the well being of a man who had left the hospital about a half hour prior and still had an IV in his arm!!! Not sure if he just got up and walked out or if they actually discharged him that way!!! Well, like I said, you only get about a third of the story from what you hear on the scanner. I'm thinking maybe there had been 'prior history' there with the 16 year old. Sheriff Deputy radio traffic to Central Dispatch... I'm just going to hang around here in the Walmart parking lot... I just saw Captain America heading in there... long, long pause from CD... I'm guessing she was asking a co-worker if she heard that right.... finally a just barely audible... allright. 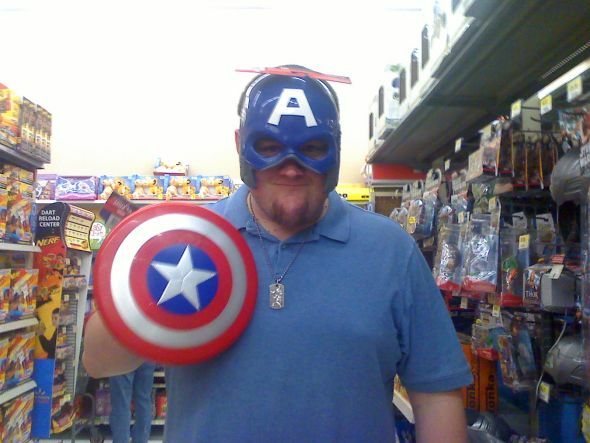 So I'm thinking we may see Pax posting some more pictures in the Walmart thread soon... or Captain America... on 2nd thought... maybe it was Pax posing as Captain America!!! Brown Pug dog stolen from Downtown Hound!!! we don't get many 'dognappings' around here but a pair (I think they said M and F) just stole a brown pug from the Downtown Hound on N. Monroe Street. Suspect vehicle was north bound on Monroe Street!!! Re: Brown Pug dog stolen from Downtown Hound!!! Did they put out a K9 Amber Alert? I've heard one call for road rage and another one a dispute between boyfriend girlfriend... both calls in less than 24 hours and both ended up with a destroyed auto windshield! Whatever you do, I suggest nobody go to monroe glass!!! Some of this you just couldn't make it up any better if you tried. A man called 911 and has requested a deputy to come to his home and investigate because he feels he is being harassed by some type of electronic devices and he knows this because he is a mind reader!!! I gotta get me one of those scanners!